Цена действительна при отгрузке за пределы Российской Федерации. The specified price is valid only outside the Russian Federation. Semitrailers with aluminum bodies, which have already become widespread in the agro-industrial complex, will soon be able to push the position of steel tipper semitrailers in the area of construction transportation, primarily in working with sand and small fractions of crushed stone. By functionality, modern aluminum bodies are not inferior to bodies made of steel. High-quality body with a geometric volume of 27 cubic meters. is made from a hollow aluminum profile that is not subject to negative environmental influences. The front wall of the body is inclined at an angle of 20 degrees. Two longitudinal stiffeners inside the body, located along the walls, also have a slope of 45 degrees. These measures are designed to reduce the adhesion of the load during loading and increase the safety of operation. On top of the body is equipped with two removable crossbars, tightening the sides. The semitrailer is equipped with a Binotto hydraulic cylinder with a working pressure of 190 bar. A special valve is provided to regulate the height of the opening of the hydraulic cylinder, and thus the determining angle of lifting the body. This is important for working on elevators and unloading points with a height restriction. 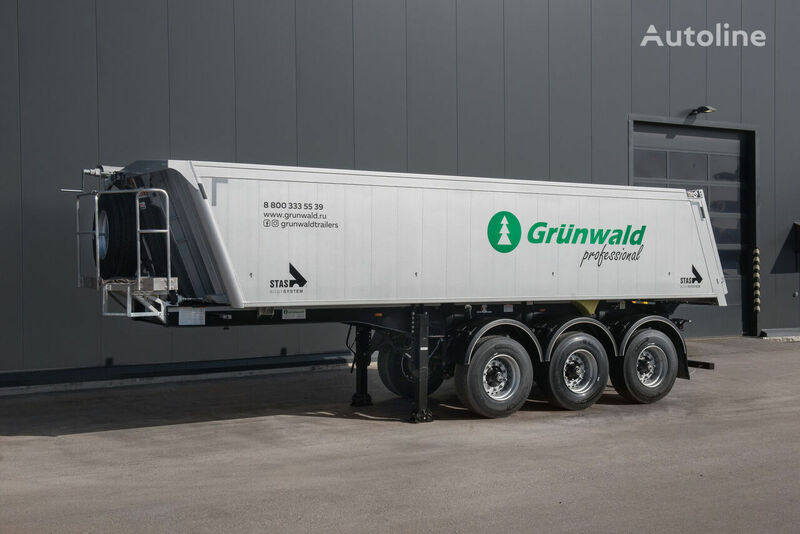 Three axles of BPW ALO or SAF Custom Design are installed on the semitrailer as standard, in the Heavy Duty heavy duty version with a lifting capacity of 9 tons each on the air suspension and the WABCO pneumatic system. The axles are fully adapted for difficult road conditions and have an increased resource compared to the standard "European" axis. Brake mechanisms of drum or disk type. All hinged components - axles, pneumatic system, electrician and support devices are purchased directly from leading European manufacturers. This approach ensures reliability in operation and simplifies the maintenance of equipment due to a greater number of service stations and the availability of spare parts. On request, various options are offered, starting with the lifting axle mechanism and pumping the extinguishing window in the back board and automatically lowering the air suspension. The proposed options are designed to further expand the application of the semitrailer and reduce the temporary loss during operation.